You’ve been looking forward to the new novel by Will Buckingham, a favourite blogger and a remarkably clever, versatile and talented writer. You very much liked his first published novel, Cargo Fever, about a man-like ape on an Indonesian island. It was a one-off, weird and wonderful and immediately engaging, where so many excellent novels these days are more of the same. 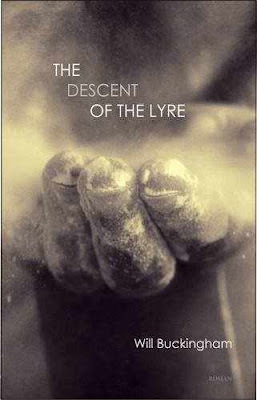 The Descent of the Lyre is a slimmish hardback volume (also to be published as a paperback and e-book), beautifully produced by Roman Books. You find it, for all the immediate drama of the storyline, conducive to gentle, uncompulsive reading - you who wish, mostly fruitlessly, to become a less avid and compulsive reader. You read it quietly and at first coolly, and slowly it gets to you and binds you with its quiet spell. It brings tears, even, which is not what you expect from something more fabular than realist. You find yourself admiring this book very much: the fluid, flowing prose and fierce, colourful historical detail. Painted scenes of an early nineteenth century that seems much more than two hundred years ago - from rural Bulgaria's wild mountains full of outlaws in the harsh vastness of the Ottoman empire to the cosmopolitan streets of Vienna and Paris - leave a strong impression. But mostly it's a moral fable. It's the old, old power of story, about which the author has written in his philosophical work, Finding our Sea Legs: Ethics, Experience and the Ocean of Stories. It's a tragic, mythic tale of a memorable hero - Yvan Gelski: bandit, musician, saint - and it illustrates enduring truths: that life is cruel and suffering draws out our greatest weaknesses and faults as well as strengths and goodness; that talent, beauty, art (in this case the music of the guitar, of which Will knows much) may be redemptive, and then again may not; that the storyteller’s voice is powerful and lingers long in the mind. This stark, sad story somehow makes you feel a bit better about life, but not in any way that's false or facile. It's different from anything you’ve read in ages, and a fine, humane, intelligent work. Will writes about The Descent of the Lyre here and here. Read an extract or listen to a podcast here. You'd both love this, I think, Dale and Beth. I was inspired to write in the second person by the novel's first and last chapters, which are in that form - see linked extract.